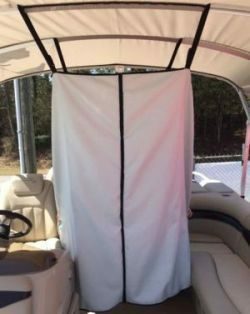 Instant privacy on your boat to use while changing or portable potty use! Great for use as a changing room or portable potty enclosure. Made with Marine Grade Polyester – Poly-Flex. Attaches to bimini top with 1″ polypropylene straps with quick release buckles. Height is adjustable up to 60″.